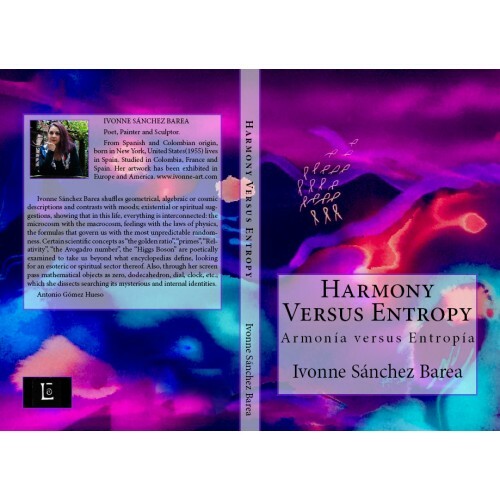 Harmony Entropy Versus and its poems, not by chance, but consciously, interweave concepts of philosophy and science with those of life; the wonder into the paths of investigation, inquiry and search for answers to existential questions. Formulations, whose responses per se, exist in nature, in humans and in all that surrounds us, explains the poet, Ivonne Sánchez Barea. Concepts of space-time, justice, fate, magic and knowledge are mixed in her pen. She makes a poetic description of the instant, delves into micro-cosmos, as in the poems of fractal and broccoli in geometric shapes as in the case of the dodecahedron and the sphere, making a journey to the stars, light and natural elements, finding similarities in humans, since their origin and destiny. Relates ones with others, as in prime numbers, making parallels between similar sets and those of the same species. Everything is relative in this poetic journey, and from her womanhood, affirms; weaver and builder of arks and arches, bridges and roads, routes of encounter dating from philosophical thought. In the event's horizon, she sees beyond the simply being; to be, a little more a better person parting from this sensitivity. Like love and lovers, this collection contains the magic that will carry them towards numerical infinity, the indescribable feeling and greatness of soul where the reader will find, in the end, at the center of the bell time, reason and existence, perhaps finding some answers. Keys, keys of knowledge, that as the Sorcerer's Stone, from the poetic spirit, is wielding the genesis of the centuries and draws an, imagined by Newton, hologram, which will lead to internal fields of thought and passion, and as a fire, or a prayer, arrive home; says the poet. A house of water and sugar, like the poetry and spirit of this author, who comes to be further diluted in You, dear reader.